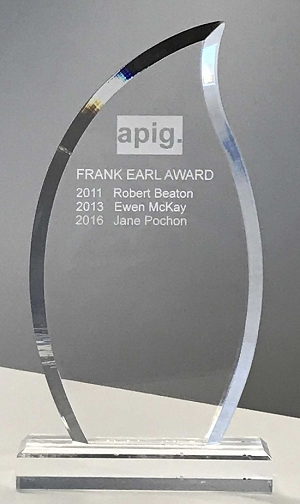 The APIG Kennedys Frank Earl Award is conferred on an individual who demonstrates excellence in the professional lines sector of the insurance industry and personifies the values synonymous with Frank Earl: HONESTY, INTEGRITY and TRANSPARENCY. Submissions for the 2018 APIG Kennedys Frank Earl Award will be open from Monday 28 May to 11 August 2018. Nominations must be accompanied by a short statement and resume outlining why the nominee should be considered for the award. The winner will be announced at the 2018 APIG National Conference Gala Dinner on 6 September 2018. The award is named for Frank Earl who was one of Australia’s most highly regarded insurance brokers. It was established in 2010 and is presented biennially at the APIG National Conference. Frank Earl personified HONESTY, INTEGRITY and TRANSPARENCY in his exemplary career. He considered these to be core characteristics fundamental not only to individual success but also to the industry as a whole. The core criteria for evaluation of nominees will be their ability to show how they conduct themselves in their day-to-day work and more broadly as a participant in the industry in a manner which consistently reflects Frank Earl’s three core values. Nominees' overall professionalism in their service to the industry, including leadership, innovation and creativity, and commitment to continued professional development, further education and mentorship are all be considered. Any participant in the professional lines sector of the insurance industry who is a current member of APIG can make a nomination or be nominated for the award. This includes underwriters, brokers and claims personnel, from insurers and reinsurers, as well as consultants, advisers and lawyers, among others. There are no restrictions on age, role or years of experience. Nominations made by third parties will remain anonymous and self-nomination is permitted. Financial support up to a value of A$6,000 to attend the 2018 Professional Liability Underwriting Society (PLUS) conference in San Diego, including registration, travel and accommodation. APIG wishes to thank Kennedys for its generous support of the Frank Earl Award.